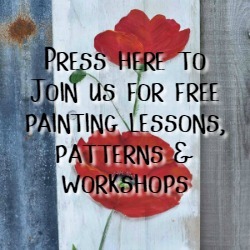 Join us for painting lessons, free printables and more. Yes, please! 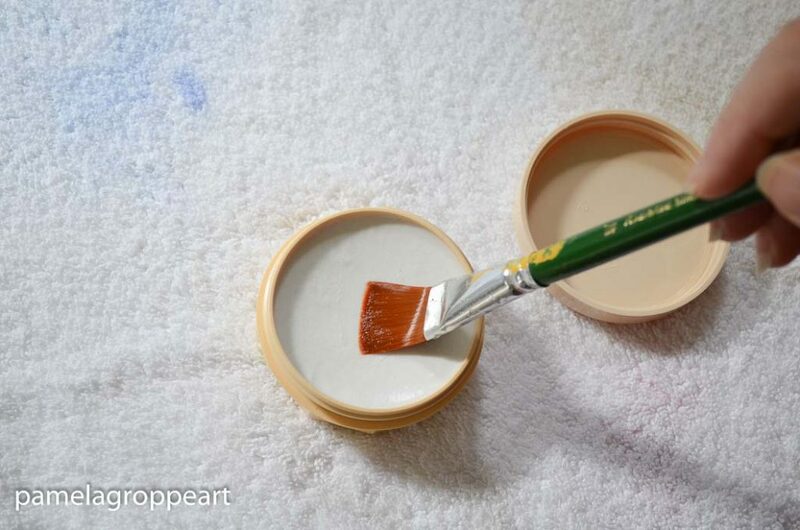 Basic Paint Brush Care to get the most life from your brushes. I have used many methods to clean my brushes and this one has been the best for me. I use inexpensive brushes but they do a great job as long as I care for them properly. 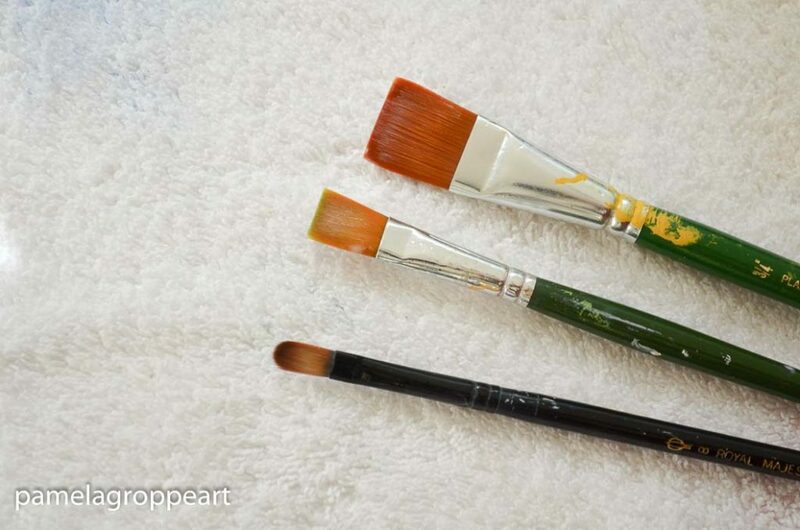 Your paint brushes are your friends, they can make or break your attempts to create a wonderful painting or get the effect you are aiming for so basic paint brush care is essential. Today I am going to show you how I get the most from my brushes and keep them working like new for as long as I can. I have tried many brands and styles of brushes. One thing I have learned is they do not need to be expensive but they do need proper care. I confess I have ruined a few. Not intentionally… but from lack of basic brush care on my absent minded days. Here is a link to my Painting Supplies post where I list some brands I use that won’t break the bank. Currently, I am primarily using the Donna Dewberry One Stroke set. I ordered some from Amazon back when I started referring folks to them for the brushes as I wanted to be sure the ones sent were of the same quality I had been using for a long time. I can confidently say they are and if you give them the TLC they deserve they will serve you well. I am also using the 3/4″ brush that comes in the set for an impressionistic painting workshop I am currently taking and it works as good as the one suggested by the instructor. One trick to keep in mind when painting with acrylics is to dampen your brush before you load it with paint. Not dripping but just damp. Starting with the bristles damp prevents the paint from drying in the bristles too quickly and building up making you lose your chisel edge while painting. 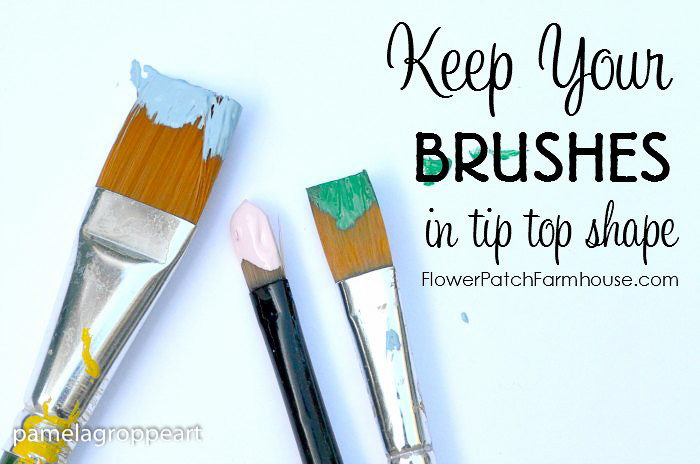 It won’t stop it, but it will lengthen the amount of time you have before you need to completely rinse your brush out to get rid of too much paint in the bristles. 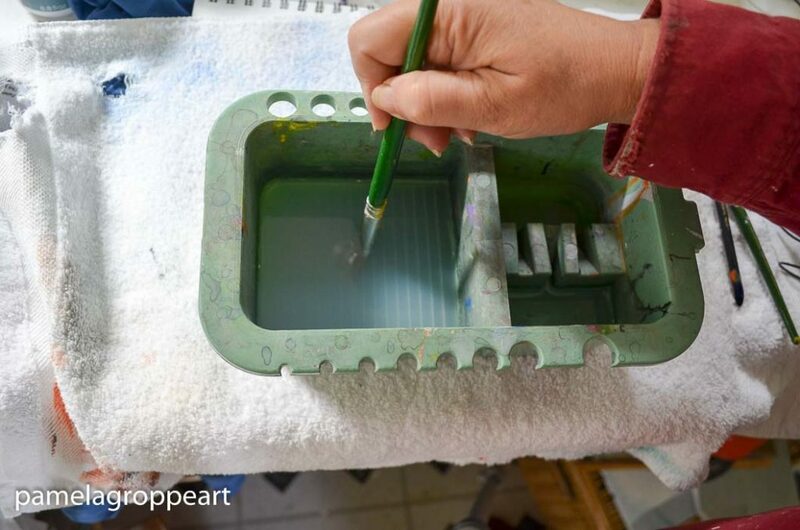 My go to tool that I love and would not be without when painting is my brush caddy basin. As you can see my brush basin is well used. The ribs on the left side are wonderful for getting paint out of the brush thoroughly. When I need to clean my brush I start in the ribbed (left) side of the basin and run my brush up and down the ribs, not hard but enough to work out the paint. Next I rinse in one of the right side sections, dab on a towel (paper or cloth) and continue to paint. 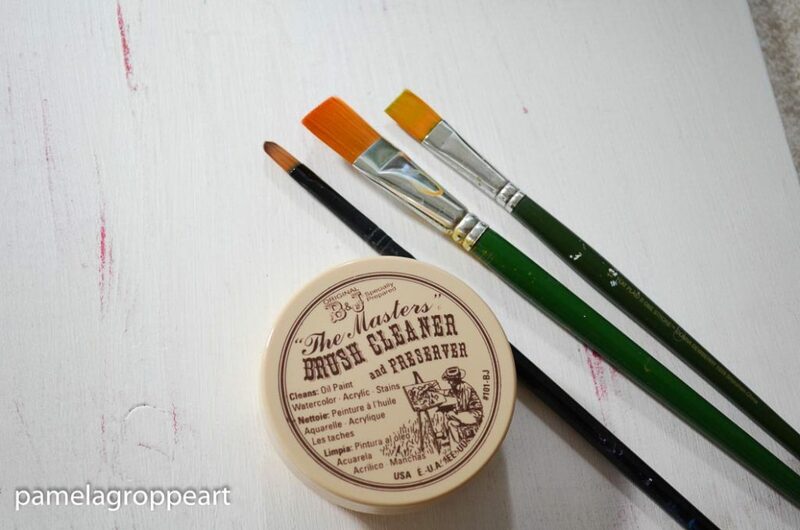 If I am getting ready to do a final clean on my brushes for the day I will use my favorite brush cleaner. I have tried many including just plain dish soap but I always come back to this one. After rinsing the paint from the brush on both the left then ride side of my basin I stroke my brush in the brush cleaner, loading it well. Then I take my brush back to my basin and repeat the washing in both sides. By now the water in ribbed side of the basin has gotten dirty, so rinsing in the right side helps to get rid of even the dirty water. The right side water should stay cleaner. 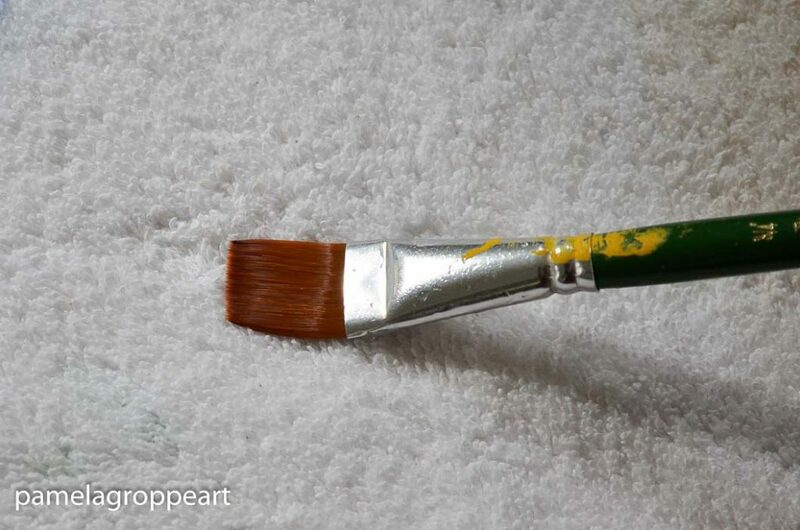 After rinsing I stroke the brush back and forth on a white absorbent towel or paper towel. My final step is to lather up the brush with the The Masters Brush Cleaner and Preserver and reshape my brush with my fingers. I do not rinse out, I let the cleaner dry in my brush. I lie my brushes flat to dry. And that is basically it. My brushes will last me a long time using these methods. A clean brush is a happy brush. Would you like to receive the latest painting tutorials, traceable patterns and more? Just fill out this form and you can join us. 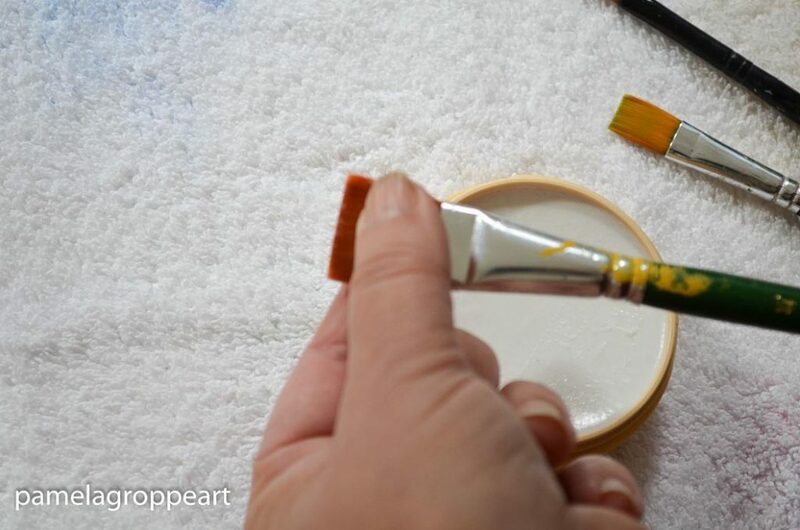 Do you have an tips or tricks for keeping brushes in tip top shape? I would love to hear them. I follow these sames steps with great results. I use a bar of Ivory soap instead of the cleaner. I also have a small plastic disk that is covered is with “bumps” that I hold in my hand. 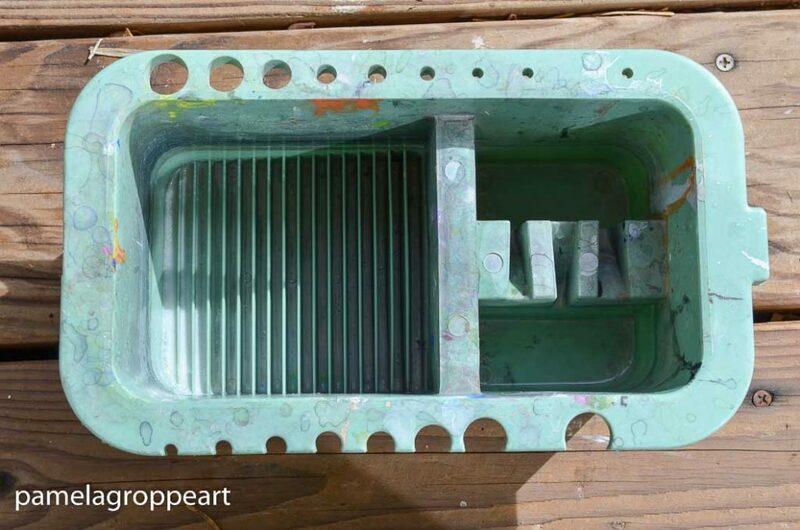 It would be similar to running the brush across the ribs in the basin. However, I do this at the sink so I can rinse and repeat easily. Hi Susan, I too used other soaps but found the Masters not only cleans but conditions the bristles and I got a longer life from them. I also would use dish soap, like Dawn or Joy which did a good job cleaning but they did not condition either. Some of my painter friends really like using Murphys Oil soap but I have yet to try that one. I have the same brush tub (only round) and I use warm water and a few drops of Dawn. Then when I’m done, they all go with me to the sink along with the tub. I’ve always wondered what difference that brush soap makes. I’ve had a few brushes for about 20 years (including the kids brushes with the chunky handles). Yes, it’s just like yours only round and gray. I’ve actually been thinking of buying that one and having both on the table so I don’t have to stop what I am doing and change out my water so often. AMAZING article. Will save as a resource. Thank you! 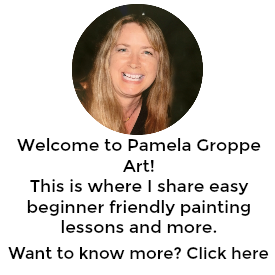 pamelagroppe.com is a participant in the Amazon Services LLC Associates Program, an affiliate advertising program designed to provide a means for sites to earn advertising fees by advertising and linking to amazon.com.